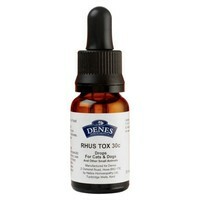 Denes Rhus Tox 30C is a homeopathic supplement that can be used for arthritis, stiff joints, back pain and rheumatism. Rhus Tox can also be used for strains and sprains, and works where stiffness is evident and is worse in damp, cold weather and after rest. The drops can also be used to treat skin problems, especially those that are allergy related.